At its massive new housing development in San Mateo, developer Coastal California Properties is pushing a concept it calls “alt-urban” or alternative urban that aims to offer the best of two worlds: the charms of a bustling downtown in a suburban setting. Residents living in suburban areas such as the Peninsula want to ditch their cars, reduce their carbon footprints, and live close to their jobs, shops and cool places to go in their free time, said Brian Myers, a partner with Coastal California Properties based in Newport Beach with an office in San Francisco. That concept helped guide the developer’s proposal for a 935-unit apartment complex on a 14.5-acre site neighboring the Hayward Park Caltrain Station. The firm’s project, Passage at San Mateo, is one of four housing developments in the works that could bring more than 2,000 homes to San Mateo in the next five years. 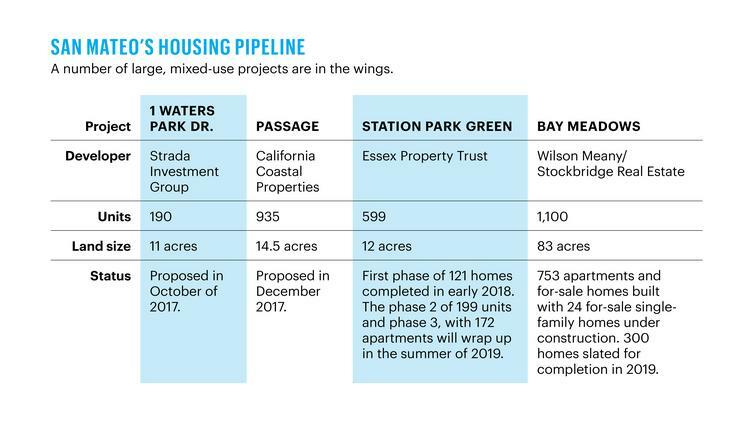 Other projects include Essex Property Trust’s 599-unit Station Park Green, Strada Investments’ 190-unit housing development at 1 Waters Park Dr., and the last 300 homes in Wilson Meany’s Bay Meadows development. The Peninsula, nestled between San Francisco and San Jose, has remained a largely suburban area where cities prize their small-town feel. Nonetheless, the area is a powerhouse for jobs, but is also starved for new housing supply. From 2010 to 2015, San Mateo County added 54,000 jobs, but only 2,148 new homes. Developers say it is hard to find available land to build housing in addition to facing other challenges such as high construction costs, lengthy approvals processes and neighborhood opposition. “The Bay Area, and particularly the Peninsula, is so incredibly undersupplied with housing,” said Michael Cohen, a partner with Strada Investment Group, which has proposed demolishing two office buildings totaling 162,000 square feet on 11 acres of land to make room for the new homes. The site is near the intersection of Highway 92 and 101. “There is an opportunity to do something that is pretty unique to deliver nearly 200 units of housing that will reduce traffic,” Cohen said. One of the top reasons people oppose new housing is the concern that it will generate more traffic. In the case of the Waters Park Drive development, the homes will produce less traffic because residents drive less than office workers. Across the street from the Passage site, Essex Property Trust is close to completing the first, 121-unit phase of Station Park Green, an apartment community that will be completed in four phases this year and next. Leasing for the first phase started this month, said John Eudy, chief investment officer for Essex Property Trust. Those two developments are adjacent to 400/405 Concar Dr., a new 305,000-square-foot office development from Hines and Pearlmark. The project, completed in early 2017, is 70 percent leased to software maker Medallia. Proximity to jobs is key for high-density projects like Passage, Myers said. More than 5,000 jobs are located within a five-minute walk from the site. The nearby Caltrain station will help attract people who work in San Francisco or the South Bay. A few miles south of the Passage, developer Wilson Meany is following a similar formula of creating a new community centered around transit at Bay Meadows, where close to 800 of the planned 1,100 homes have been built as a mix of for-sale and rental. The 83-acre development is also slated to include 763,000 square feet of office, 41,000 square feet of retail and 18 acres of open space next to the Hillsdale Caltrain Station. Myers’ firm submitted a pre-application to the city in December for the Passage and expects to spend this year refining its formal application. In the best-case scenario, it will take about three years to secure approvals and permits to start construction. Myers declined to estimate the cost of the project. Brookfield is the equity partner. The Passage will contain about 35,000 square feet of retail including a Trader Joe’s. The small grocer is a tenant in the existing 160,000-square-foot retail center that currently occupies the site. The developer is working with MVE Architects to design retail and amenity spaces including a food hall, co-working space, pedestrian pathways and locations for car-share pick up and drop off. The developer also envisions a central hub for transit connections and package deliveries including cold storage for food.